I was honoured last year to be elected as President of the Little Ship Club. I wonder if the founders ever imagined that the club would still be in existence 54 years later? Anyway with that statement in mind, I set forth to create a programme of events and activities that I would be interested in, I begged my friends who’d had interesting sailing adventures, met new people and asked them, listened to what people wanted to do, and then I spread the word far and wide to as many people as possible. I have to thank Naval Point Club Lyttelton, The Akaroa Cruisers Group, and the Purau Moorings Association for allowing me to glean some details of people who might have been interested in coming along to some of our events. I managed to build our database to over 500 email addresses and have got a Mailchimp newsletter set up to easily be able to spread the word out to all these keen cruisers. Our membership base has swelled and we regularly get 70+ attendees to our talks. I had already set up a Facebook Page last year (which now has over 150 likers) and I also created a Little Ship Club Website to further promote what we have got coming up, our history, how to become a member and as a place to store some of the fantastic information and photographs that we learn at our sessions. Promoted the Coastguard Boating Education courses being run at Naval Point. Had a raft up in average weather, but with great company and photographs! Mike & Kirstin Brown did a great talk on their adventures sailing across the Pacific with a baby. Matt Vance gave a great introduction to his book “Ocean Notorious” which I can’t wait to read now. We also had an exclusive visit to the Dry Dock and the Torpedo Boat Museum two places I had been wanting to visit for a very long time! Finally we also had a brilliant training session on the use of fire extinguishers and fire prevention on boats. Many thanks to all our fascinating speakers. We have got such an immense amount of boating knowledge amongst our speakers and members, so this group is brilliant for networking if your dream is to sail off in to the sunset – like mine! We are in the process of getting some speakers, events and activities lined up for the New Year. The Spirit of Adventure is hopefully going to be in Port in February, John McKim is going to do a session on marine electronics, and Bob Jones is hopefully going to speak about some of his voyages. If you have any ideas or suggestions of other things to add in 2016, please let us know! One thing the Little Ship Club deliberately didn’t get involved in was the Port Recovery Plan submissions. Our members had differing opinions on the inner harbour marina, so I made a conscious decision for the club to remain neutral on this topic. 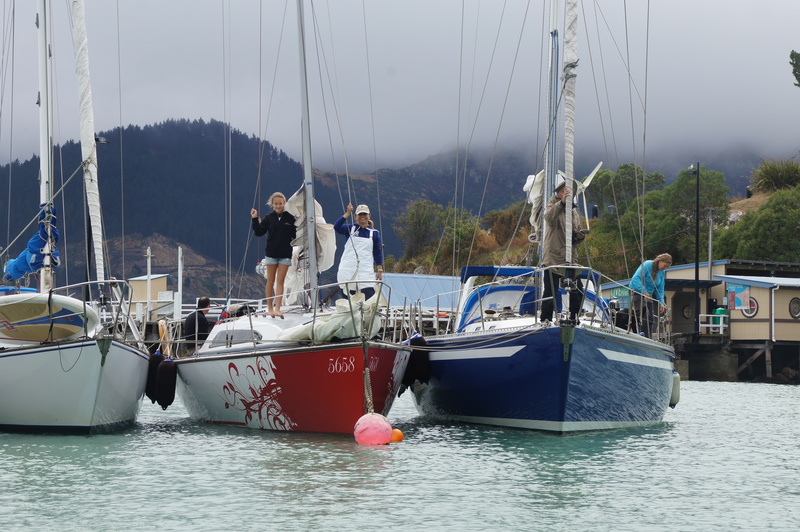 The Akaroa Cruisers Group also have a fantastic newsletter and sessions going on over their side of the hill, and they have also very kindly shared some of their notes about painting, the use of VHF, how to make soft shackles and their programme of events with us which I have also loaded on the blog. It has been really great partnering up with John Milligan and his team to further enhance the range of activities and events available for cruisers in Banks Peninsula. Many thanks to Ross, Matt, Brian, Rachael & Hannah and the Naval Point Club team for allowing us to use the clubrooms for our events and for opening the bar so we can enjoy a drink and a catch up (remember to sign in if you aren’t an NPCL member!). Please come along to our AGM on Thursday 15th October at 7pm, followed by a talk from David & Jackie about their adventures in the Pacific on their legendary boat the Brigadoon. I promise the AGM will be short and sweet and the bar will be open too. Finally I would like to thank Richard Jones for all his hard work being the Secretary and Treasurer. Richard is keen to hand over the treasurer position if anyone is interested in helping out? Kirsten Netley did a great treasurers job as well last year before having to hand back to Richard. I’d like to thank Ron Dards for all his encouragement, and to the rest of my committee Mike Rossouw, Garrick Johnson, Ray King-Turner and John Ashbey. And also Sue Stubenvoll for all her support and enthusiasm too. If you would like to join our committee then please let us know. I would also like to thank the youngest Little Ship Club member – Seth Moore (my son) for coming along to most of the events and helping to get everything set up for us! Finally I would like to thank all our members, everyone who reads the newsletters and attends our events. It wouldn’t be half as much fun without you all there! I look forward to catching up at the AGM and our next functions.